Send a busy mom or dad in your life a gift card for a lifetime membership. 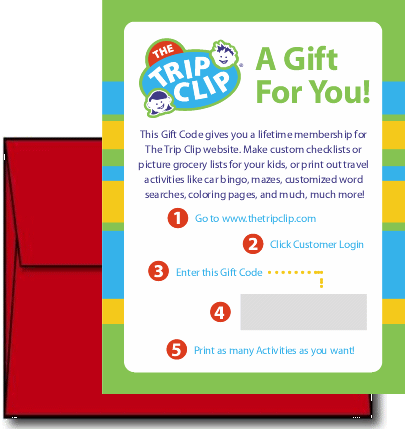 They'll be able to edit and print all of the 35 Activities offered at www.thetripclip.com. The Gift Card ships with an unprinted, festive red envelope. Your gift message will be printed on white paper and inserted into the red envelope along with the Gift Card. The Gift Card will have a unique Gift Code printed on it. The recipient simply needs to enter the Gift Code on the Login page to begin using All the Activities. All products are shipped via USPS First Class Mail from Washington State. Although no shipping speed is guaranteed, domestic purchases typically arrive in 2-4 business days, depending on how far away you live. International shipping times range from 1-3 weeks.